The elliptical machine is one of the best low impact trainers you can use in order to burn calories through exercise. An elliptical works in a similar way to a stationery bicycle. However, you are primarily in a standing position. Ellipticals also provide a very natural gliding motion that may be preferred to other full body cardio machines. Modern day home ellipticals offer a variety of settings to suit every user ability and age group. You can get a good workout machine without spending your whole paycheck. We have found the best ellipticals under $500. If you are looking for an even better deal, check out our Best Inexpensive Elliptical Machines Under $300 article. Our top pick for the best elliptical under $500 is the Exerpeutic 500 magnetic, with its double flywheel transmission, smooth and natural operation and 3-piece crank system. This all adds up to a high tech elliptical machine at a low tech price. 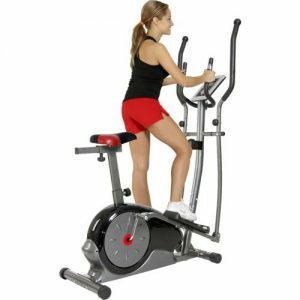 The Exerpeutic 5000 Magnetic Ellipticalprovides you with a double drive transmission system to deliver a smooth natural elliptical motion. The stride length of 18 inches is impressive for a machine under $500. Overall this is a very impressive unit. The Exerpeutic 5000 Magnetic features a sleek and slim design to provide a natural stride motion. The pedals are just six inches off the ground in the resting position, allowing for easy on/off. This is great for the elderly and people with joint complaints. The distance between the two pedals on the Exerpeutic 5000 Magnetic is just six inches. This reduces strain on the inner thighs when exercising. The 18 inch stride length on the Exerpeutic 5000 Magnetic provides a comfortable and full range of motion, which is something that is often lacking in budget home use ellipticals. The dual handle bars on the Exerpeutic 5000 Magnetic provide a complete upper as well as lower body workout. It tones the arms and shoulders while also hitting the quads and glutes. The heavy duty steel construction of the Exerpeutic 5000 Magnetic makes it a reliable performer that will not sway or move round when you are going heavy. The maximum user weight on this unit is 275 pounds. Extended leg stabilizers prevent any side to side movement or tipping when exercising at any intensity level. The strong and durable 3-piece cranking system of the Exerpeutic 5000 Magnetic provides smooth performance and continuous momentum. This ensures that you are getting a very natural motion. The Exerpeutic 5000 Magnetic operates with a two flywheel and two belt drive system. This provides you with a far more powerful and smooth motion than most other single flywheel drive systems. The magnetic system reminds us of the magnetic drive system in the Schwinn 460. Read our complete Schwinn 460 Elliptical review here. The large stride pedal design prevents any slippage when exercising. Striding with the Exerpeutic 5000 Magnetic is smooth and quiet, thanks to the double transmission belt drive. With The Smart Computer Console on the Exerpeutic 5000 Magnetic , you can choose from 12 different training programs and 7 training modes. The computer also allows you to determine just how challenging you want the workout to be by selecting from the 24 level magnetic tension system. Something that you won’t find on a lot of budget elliptical models is a programmable user interface. You’ll have to buy a more expensive option, like a Bowflex elliptical, to get that. Check out our Bowflex BXE116 and BXE216 Elliptical Review to see a programmable option for up to 4 users. The Exerpeutic 5000 Magnetic is am extremely impressive budget elliptical trainer. It’s the only elliptical we have found under $500 that provides you with double transmission system. It also has better stride length than most machines at this price point and delivers an incredibly smooth, quiet performance. 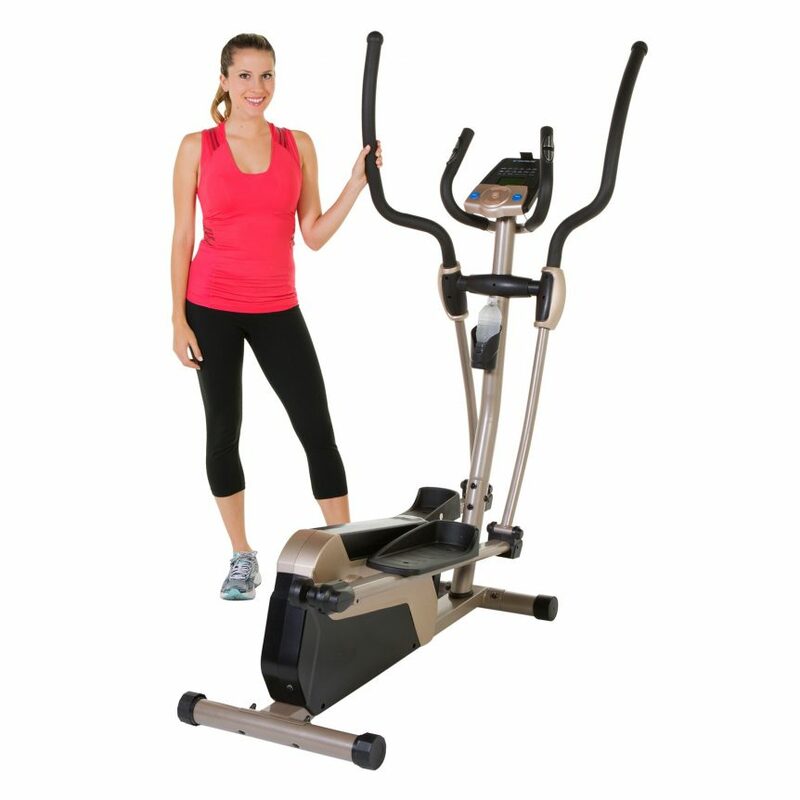 Exerpeutic also offers their 1000XL Elliptical. It’s cheaper than the 5000, but it’s defintiely not as nice. Check out our Exerpuetic 1000XL review here. The Universal E40 heavy duty elliptical boasts a perimeter-weighted flywheel that provides a natural, fluid striding motion. The steel frame is very sturdy and compact. The handles are foam padded to provide comfort when gripping the handles. You also get a 17 inch stride with the Universal E40. The Universal E40 provides you with a solid flywheel that is perimeter weighted to give you the smoothest, most natural movement when you are striding on the machine. This quality of flywheel is rare for a machine that comes in under $500. It reminds me of the more expensive Schwinn 430 and 470 Ellipticals. The Universal E40 is made from heavy duty 12-gauge steel framing. This provides a very robust base to work from. Unlike many lesser models in this price point, it will not tilt or otherwise feel unsafe when you are training at max intensity. The maximum user weight on this machine is 275 pounds. A 17 inch stride length my be considered short for a commercial gym elliptical. For the budget home market, however, it is quite acceptable. It is among the best stride lengths in our review round up and should provide enough stride for the majority of home users. The LCD Monitor on the Universal E40 provides you with a large interface and clear digits. It gives you a scan readout of your key training diagnostics, including calories burned, speed, distance and time. The handles on the Universal E40 feature foam grips provide you with a comfortable, non slip gripping experience. The Universal E40 has 8 levels of magnetic resistance. This provides you with the ability to progressively improve the intensity of your training as you continue to make progress. It also accommodates all members of the family and all fitness levels. An eddy brake resistance system provides a very smooth stop / start to your workout. The Universal E40 comes with a 3 year warranty on the frame and mechanical parts, with 1 year on the electronics. The Universal E40 only provides you with 7 built-in workout programs, which is the lowest number of any of the ellipticals in our review roundup. The Universal E40 is a very solid elliptical that comes with a heavy duty flywheel to provide you with a natural, jerk free elliptical movement arc. It has the largest stride length of any of the ellipticals in our review roundup. The ProForm Hybrid Trainer provides you with both a recumbent exercise bike and an elliptical trainer to give you double value and twice as many workout options. With this machine you get both an elliptical and recumbent bike. This makes for extremely good value for money while also vastly extending your workout options. This is especially beneficial with people who suffer from back complaints, as the recumbent bike back has generous spinal support. The elliptical transforms into a recumbent bike in 3 easy steps. If you are willing to venture into a higher price bracket, you can find a lot of cool machines that have dual functionalities. We love the Bowflex Max Trainers, which are like ellipticals and stair steppers in one. We also like the Treadclimber, which is like a treadmill and elliptical wrapped into one machine. We compare these more expensive machines in our Bowflex Max Trainer M3, M5, M7 vs Treadclimber TC100, TC200 article. The elliptical allows for an incline of up to 16% to provide you with a great way to intensify the challenge of your workout. The quality steel frame of the Pro-Form Hybrid is very durable and rigid. You will feel completely safe and secure on this unit, even when training at maximum intensity. The pedals on the elliptical are oversized, allowing you always maintain your grip. Cushioning with the pedals provides for extra comfort when you are striding. The silent resistance magnetic technology used with this machine makes for a very quiet workout. In fact, the elliptical operation is so silent that others can watch TV right alongside you with no distractions. The Pro-Form Hybrid has 16 built-in workout programs to add variety to your workout. Each program has been designed by a certified personal trainer. The levels provide options for all users from beginner to seasoned athlete. You get 16 levels of smooth magnetic resistance on the Pro-Form Hybrid, providing you with progressive workout adjustments to meet your improving fitness level. The Pro-Form Hybrid comes with an MP3 Port, iPod compatibility and two built-in speakers. Any time there are extras like a build-in speaker or a cup holder, you know that it’s a nice machine. The NordicTrack E 7.0z Elliptical has a bunch of nice extras like this. This unit features a clear, bright LCD screen that provides you with an ongoing readout of your vital training statistics, including calories burned and speed. Transport wheels allow you to easily transport the Pro-Form Hybrid Trainer from one room to another. At only 15 inches, the stride length on the Pro-Form my be too limited for taller users. The Pro-form Hybrid elliptical is a two-in-one cycle / elliptical that provides you with a smooth, reliable elliptical workout at home. The big drawback is the limited stride length of just 15 inches. The BodyChamp 2-in-1 BRM 3671 Elliptical is a hybrid exercise bike / elliptical. This makes it very budget friendly. It is a very sleek, comfortable machine that meets your requirements in terms of both style and function. The BodyChamp 2-in-1 BRM 3671 Elliptical is designed for both ergonomic and anatomical comfort. The foam padded dual action adjustable handlebars are designed to provide ideal body alignment when exercising, while also providing the most natural gripping and standing position. 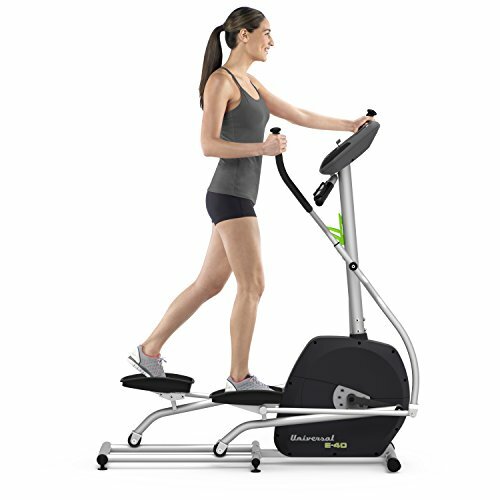 The BodyChamp 2-in-1 BRM 3671 Elliptical features large pedals with underfoot padding to allow users of all sizes and ages to exercise safely with a firm footing. The dual action movable handlebars feature built in pulse monitors that allow you to check your heart rate while you are training. The easy to use LCD monitor provides you with a scan readout of your time, distance, speed and calories burned. The BodyChamp 2-in-1 BRM 3671 Elliptical comes with twenty different workout programs built in. These provide you with a huge range of training options across all fitness levels. Your purchase also comes with a DVD guide that contains even more training options. The seat of the BodyChamp 2-in-1 BRM 3671 Elliptical adjusts both vertically and horizontally, allowing you to customize your positioning. Just by sitting down you can turn the elliptical into an exercise bike, without any tools or adjustment. That allows you to pack more workout into less time. 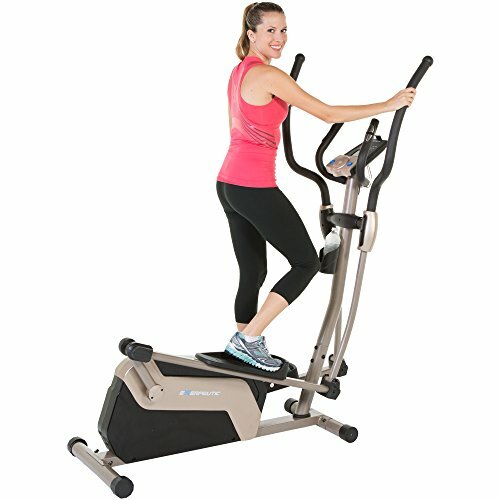 At 14 inches the stride length of the BodyChamp 2-in-1 BRM 3671 Elliptical is 6-8 inches less than what you would get in a commercial gym. This may be a limiting factor for taller users. It doesn’t produce lot of noise, but the BodyChamp 2-in-1 BRM 3671 Elliptical is not as quiet as the other ellipticals in our review round up. 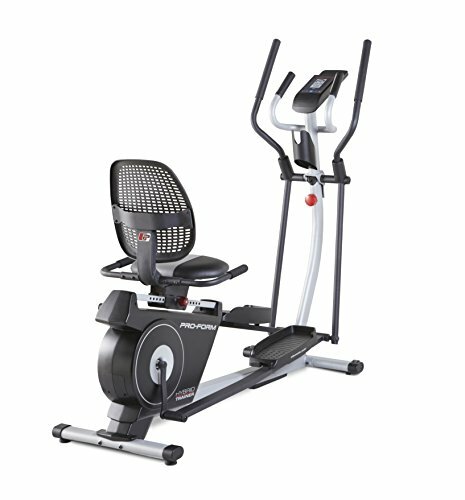 The BodyChamp 2-in-1 BRM 3671 Elliptical is a well designed two-in-one unit that allows for variety and comfort. It is the best ergonomically designed elliptical in our review round up. The stride length of just 14 inches is its biggest limiting factor. Of course, the ultimate 2-in-1 workout machine is the Treadclimber, which is like an elliptical and treadmill rolled into one. Check out our Bowflex TreadClimber TC10 and TC200 Review for a full breakdown. The Sunny Health and Fitness SF-2310 is a compact, budget elliptical that provides you with an effective, reliable workout at great price. The Sunny Health and Fitness SF-2310 is made from durable heavy gauge steel, providing you with a robust training unit. The maximum user weight of 300 pounds is good for this price range. The Sunny SF-2310 features oversized footpads that have a non-slip surface. They will fit all shoe sizes while ensuring a solid grip through the entire session. The digital monitor on the SF-3210 provides you with a clear scan mode reading of your key training diagnostics, including your time, calories, odometer, speed, and distance. The 44 pound chrome solid flywheel provides you with a high functioning elliptical motion and plenty of resistance. This is a very impressive flywheel in this price bracket and ensures that the elliptical motion is very smooth and natural. The dual action workout arms allow you to work your upper body as well as your lower body as you pump your arms withe each stride. This also adds a greater cardiovascular component to the workout. The resistance on this machine is provided by a large red centrally located knob that gives you 8 levels of variable resistance. The front of the unit features wheels to allow for easy transportation from room to room. Sunny also makes a model that is compact and affordable. It can be folded away for storage, which is awesome! Check it out on our list of Best Compact Elliptical Machines for Home Use. Sunny Health & Fitness provide a 3-year frame warranty on this product, along with 90 days on parts and components. The stride length of the Sunny Health and Fitness SF-2310 may not be sufficient to allow people over 6 foot in height to get a full stride extension. The Sunny Health and Fitness SF-2310 is a solid budget elliptical that provides a functional elliptical training experience without the frills. 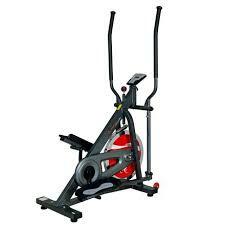 The heart of any elliptical is the flywheel and, at 44 pounds ,you get a very good one with this unit.